Recently, we brought you an exclusive backstage insight into P!NK’s Beautiful Trauma tour. 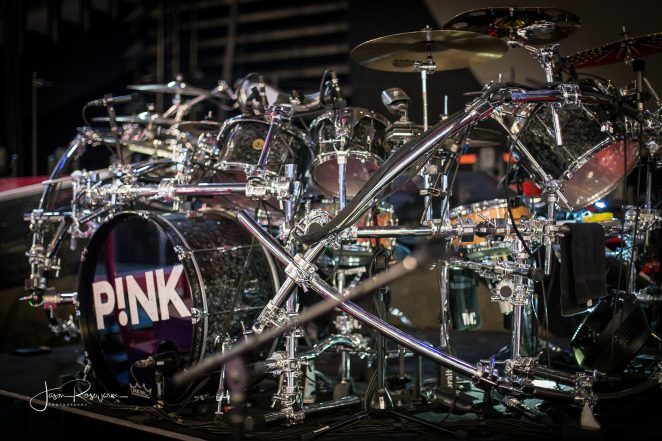 This time, we go a little deeper into the percussion element of P!NK’s show, via an interview with the tour’s amiable drum tech, Gray Grimm. 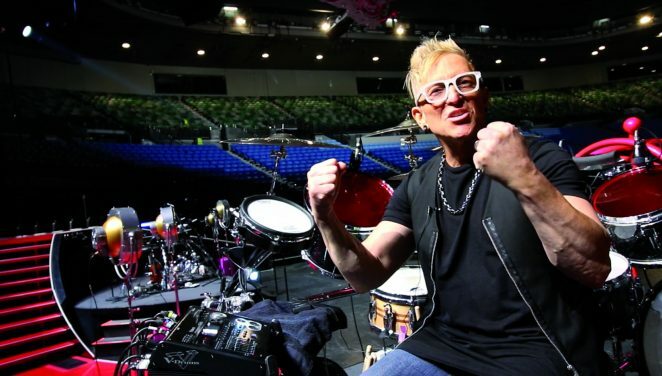 We also have a word to P!NK’s drummer Mark Schulman. “I have been so fortunate to get great gigs with great drummers and every time after a tour would be over, I would think, ‘Well that’s the only gig I’ll ever do …’ and I’d wonder, ‘What am I going to do now?’ … and another gig would pop up! It’s been a very fortunate ride for me; it wasn’t something I was planning to do, I just fell into it.” says Gary Grimm of his of journey to becoming a globe-trotting drum tech to some of the world’s finest drummers. Gary has worked with Mick Fleetwood, Steve Ferrone, Lenny White, Steve Gadd, Jeff Porcaro, and Rick Marotta to name a handful. 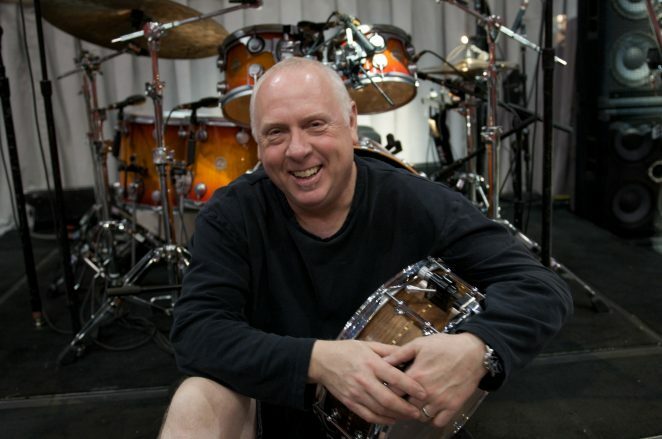 Since 2002, he has been the go-to guy for Mark Schulman, longtime drummer for pop superstar P!nk. Greg Phillips caught up with Gary and Mark at Rod Laver Arena, Melbourne during P!nk’s record-breaking beautiful Trauma tour. Hi Gary. Where did your music career begin? Did you start out playing in bands? I started at age 5 by taking piano lessons then moved on to playing drums in local bands. I graduated with a music degree from California State University, Northridge. How did you then get into being a drum tech? After college I did a lot of studio sessions renting my drums for Art Rodriguez and Ricky Lawson (may they rest in peace). At one point, Ricky asked me to be his tech for a short touring period with the Yellowjackets. That was fantastic fun. 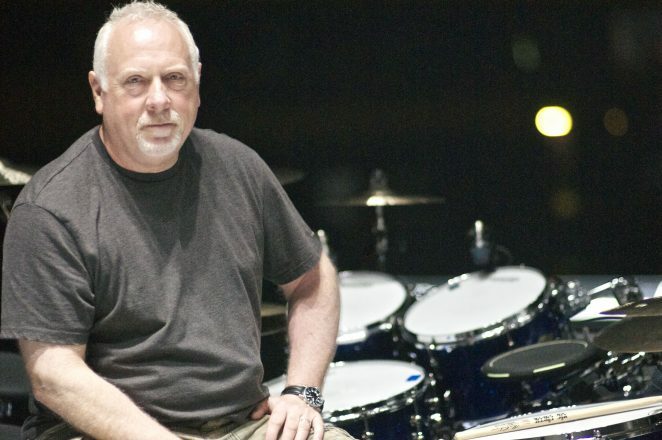 I had been asked to be the drum tech on a Michael McDonald tour and then on Stevie Nicks’ Rock-A-Little world tour with drummer Rick Marotta. After that Jeff Porcaro asked me to work with him with TOTO. Lenny Castro was also playing percussion. And it just took off from there. I have been so fortunate to get great gigs with great drummers and every time after a tour would be over, I would think, ‘Well that’s the only gig I’ll ever do …’ and I’d wonder, ‘What am I going to do now?’ … and another gig would pop up! It’s been a very fortunate ride for me; it wasn’t something I was planning to do, I just fell into it. You have worked with some of the world’s best drummers …. Mick Fleetwood, Steve Ferrone, Lenny White, Steve Gadd, Jeff Porcaro, Rick Marotta, and now Mark Schulman. How different can your job be from drummer to drummer? The difference would be who the person is and the music. Management can be different too, how they act and who they hire for production. The gig itself is pretty much the same: it’s a show, you set up the drums, you learn what the guy wants. To me, the real difference can be in how the tour treats their personnel. It’s not that I always have the choice to be choosy; I have just been very fortunate in what’s come across my plate. My criteria is mainly who the drummer is and is the music interesting. What about the different rooms that you set up in … how different can the drum sound be from venue to venue? Arena-wise, it is pretty similar, because it is just a huge big room. If you are playing theaters, there are so many different kinds of theaters: new theatres, old theatres. Old Theaters tend to be more cramped and you have to tune differently because the sound can be a bit dead. If there’s a lower ceiling it squashes your sound. It’s tough because you have to think outside the drum area. Obviously, there are some beautiful old theaters that are big and sound fantastic. That’s just it. You never know. The drummer has a unique perspective in that we sit behind everything and everybody hears it from everywhere else. The sound is so different in a 360-degree perception, you have to try to get a concept of how the drums sound outside of where the drummer sits. A lot of times I will walk around the kit while the drummer is playing and/or go out front and hear what it sounds like from afar. Just standing in front of the drummer tells me a lot. What’s the starting point for you and your job once you know you are doing a tour? I’ll contact the drummer first off. If I don’t know them or even if I do, I will call and talk to them and get a feel for their set up and what they want, how they feel about me doing their stuff and if they have anything specific they want to key in on. They may have a particular sound they want to keep. With Lenny White, it was amazing. He just said, “With your background, I’m wide open to suggestions… You know, you show me something!” That was a nice thing to say, but at the end of the day, he really does have a specific sound. But as to where I start, I just try to talk to the player to see what’s up. When did you first hook up with Mark Schulman? Mark and I started together on Cher’s tour in 2002. I got the gig through her manager Roger Davies who also manages Tina Turner and Janet Jackson. I had worked on both Tina’s tour (Jack Bruno) in 2000 and just finished Janet’s tour (Brian Frasier-Moore) in 2001. In touring, management often times gets you the gig rather than the artist or the drummer. I had known of Mark, we’d never worked together but we would run across each other. Mark is very open to a lot of things and very easy to work with. He has a very specific idea regarding the music and he’s also easy to work with. I met Mark during Pink’s Funhouse tour here in 2009. His kit is different this time around isn’t it? Yes, everything to this tour is new; the rack, the drums, and the electronics. The drums are very open sounding and big. I’m really enjoying it. I think the difference is that this kit has a little more top end to it, a little more edge. I’m finding this kit really easy to tune and very consistent: drum-to-drum. A lot of times you’ll get a kit where one tom is easy to tune and open sounding but, another tom may be more choked or dead, which is just the way it is … it’s wood, so you never know what you are going to get. This kit is very consistent: I like it a lot. Mark is transitioning from Roland TD30 V Drums to the TD50. How involved are you with the electronics and the transition? He’s pretty much turned it over to me. Obviously he has picked the sounds and what we are doing from song to song. It’s unfortunate that we haven’t been able to use the 50 from the beginning because it came up pretty close to when we were done with rehearsals. The transition also involves the sound guys, so it’s not a case of just one day turning it over … one day the 30, the next day the 50. Unfortunately in a touring situation, there is not the kind of rehearsal time where you can make major adjustments to a new system if you need to. It’ll be a smooth transition but it involves more than just Mark and myself. When did you first come across electronics in drums? There were quite a bit of electronics with Stevie Nicks and Rick Marotta. He had 4 pads across the top triggering an Oberheim DMX. That was probably the first time I really came across it. When I worked with Toto and Jeff (Porcaro) he triggered a kick sound and a snare sound from a Dynacord. It was one particular song and basically one sound, extremely minimal. Even though Steve and David (Porcaro) are massively into electronics, it was not something that Jeff was really into. He was not opposed to it; he just didn’t need it. Have there been any major mishaps that have happened on a stage under your watch? Not really. Because there are electronics, you know, the units can be a bit of a black box at times, but you do your best to take care of them. You pack them well and they ride well and all that. Once in a great while you might have a cable that has a bad solder and comes apart and you just have to replace the cable, but I have never had a unit go down. I used the AKAI MPC60 a lot when I was with (Bruce) Hornsby and then again with (Don) Henley, and that was just a real good workhorse. With Janet Jackson and Brian (Frasier-Moore), we used Alternate Mode’s DrumKAT for a trigger interface and AKAI 1000 sampler. The DrumKAT is an amazing unit, very hardy, really strong and real deep. You can do so much with that and has a bit of a learning curve but a fantastic unit. What’s on for you after this leg of the tour? After this leg I am just looking forward to resting and I have turned away quite a few gigs already because I want to devote some time to my wife, who I haven’t seen for a while, and looking forward to just relaxing. It is not that it is all hectic and stressful, it’s not, it’s just being away so long. This Australian/ New Zealand leg is so unique in that we have done so many shows in one city. 42 shows in 3 months! It’s a different feeling than when you do one or two shows and move on. Just being in one spot, the feeling you get is different because you can get out and see things. When we’re in Melbourne or Sydney where we are doing so many shows, it is almost like the hotel became my apartment. Mark, there are a few changes to the band for this tour. Was the rehearsal regime different this time? Not really, the band will get together for at least a couple of weeks just to refresh and if there’s any new material or reworking of arrangements and then we’ll do 3 or 4 full weeks of full production, which we did in Phoenix last year. There’s a stadium, old colosseum there and we do all the acrobatics and any musical changes relative to the program. 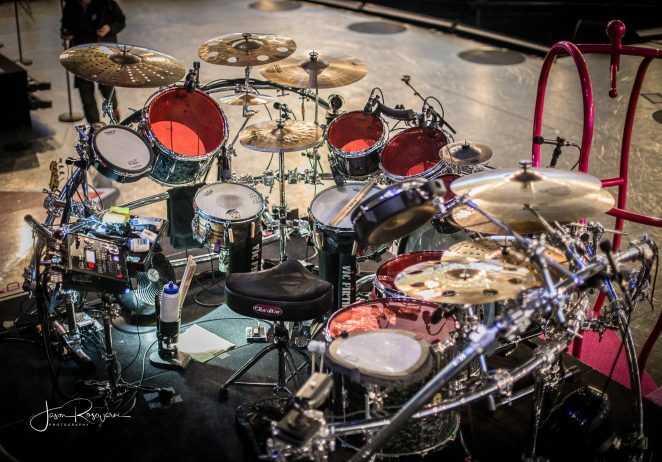 What are the factors involved when choosing a kit for a tour? I always choose the set up based on the music. Everything has a purpose. I am very particular about the drums, the drum sizes, the electronics and the placement of everything. It all has musical relevance based on what we end up doing. As an example, I used the full TD30 complete electronic kit on the Cher tour because there is a lot of full, electronic dance oriented music. On this tour, I’m just using bibs and bobs of Roland gear because it’s more augmentation. I’m using a trigger pedal, three different pads because that is what is most appropriate musically. When did you first come across drum electronics? Oh my gosh, I was one of the early, early fans of electronics. Back in 1988 I had the DrumKAT, I had the MPC60. I was even going to do a video originally with the DrumKAT because I was playing melodies and doing a lot of stuff. I always had a definitive interest. I had piezo triggers on my drums, which were set to the pitches of the drums so when you hit the drums I would get triggers of the actual pitches, until I found out the that the guy at front of house liked the sound of he drums so much that he wasn’t even using the electronics. I used to have a refrigerator sized rack of samplers and processing gear, so I have always been really into it. Yes we are in transition. We do love our TD30 and we have so much programmed and we are transitioning from programming the TD30 type of sounds into the TD50. The nice thing about the TD50 is that we’re going to sample the actual sounds from the record. Whereas with the TD30 we are emulating the sounds from the record. Yes since 1995 I have been with Vic Firth. My philosophy about gear is you use what you like. it’s like your favourite food or your mate, it’s what feels comfortable. So sticks are a very critical component, that’s what we actually touch. The feel of the electronics, the feel of pads, the feel of the drums, sound of drums, the cymbals … there are so many variable but I believe that you want to be true to yourself, so I’m not saying hey use it because I use it, it might not be their cup of tea. My wife does not like Mexican food. I try to talk her into Mexican food but she doesn’t like it. She’s a foodie, she likes French food so we don’t eat as much Mexican food as I’d like. it’s the same thing with any sound or feel of instrument, it is a very personal thing. Do you have any favourite moments in this Beautiful Trauma show? Yeah a few favourite moments. I love playing the song Beautiful Trauma because it is so groovin’! There’s a song called Secrets, where P!nk and Cassandra one of the dancers go up and do these beautiful aerials but I am using a lot of electronics in that and I’m really enjoying it. It’s like half electronics, half acoustic so I get to play some trigger kicks and I am using the pads a lot and it’s kind of a swingin’ song. We literally go from doing this huge rock song, we do a cover of Teen Spirit, so I am playing as huge as I can and then we do Secrets which is a lot more subtle and finessed and more funk and electronics.